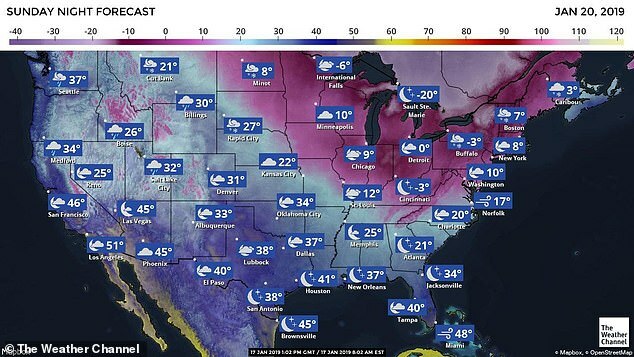 Two winter storms are marching across the U.S. and are expected to dump snow on the Midwest and Northeast before a polar vortex brings bone-chilling cold to 200 million across the county. 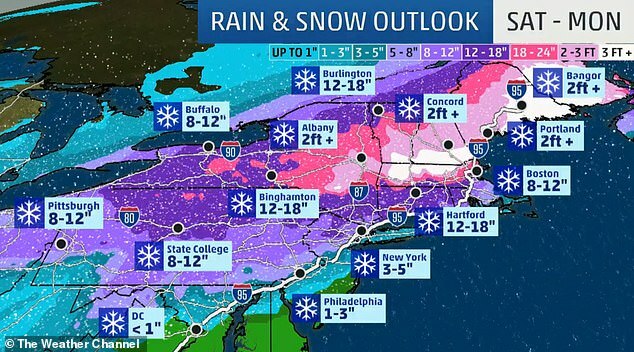 The first storm will arrive in the Northeast overnight Thursday, with one to three inches of snow expected in New York City, while the second ‘blockbuster’ storm could dump up to seven inches on Sunday. 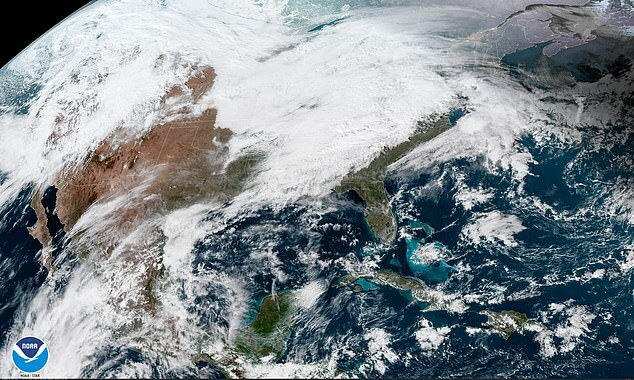 ‘Freezing rain, heavy snow, and heavy rain are expected in association with the storm system through the central and eastern U.S. over the next few days,’ the National Weather Service said of the second storm in a flash bulletin on Thursday. 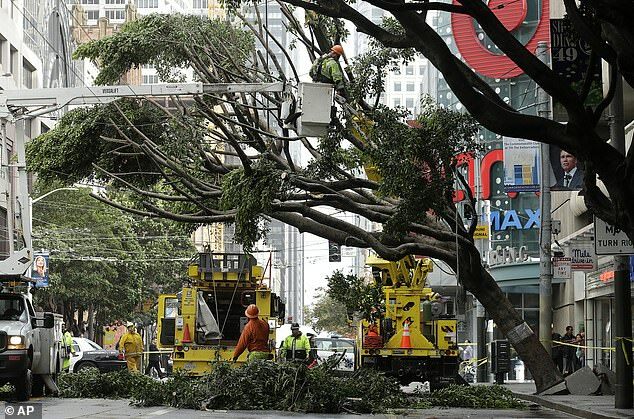 ‘The second of two storms this week will be a blockbuster in terms of impact from dangerous blizzard conditions,’ said AccuWeather senior meteorologist Alex Sosnowski, calling the first storm a ‘nuisance storm’. 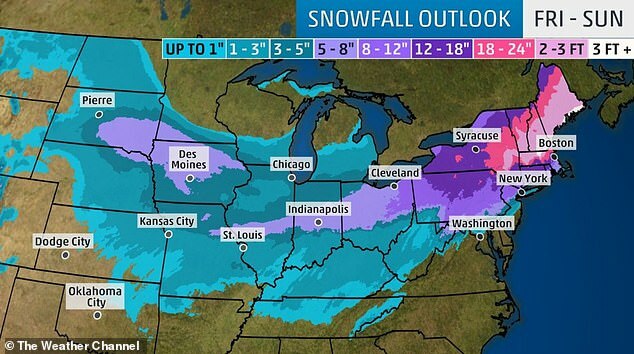 Strong winds may accompany the snow in the Midwest, potentially leading to blizzard conditions in some areas. 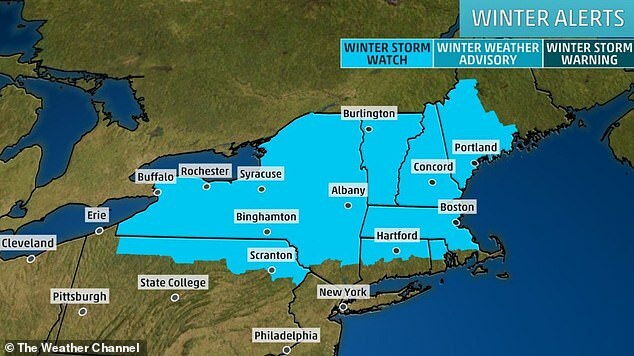 Forecasts call for as much as 40 inches of snow in parts of northern New England, with 30 inches likely in parts of central and northern New York state. The one-two punch of storms has the potential to severely snarl travel over the long weekend for Martin Luther King Jr Day. Last year, nearly 8 million people flew between Friday and Monday of the Martin Luther King Jr Day holiday. 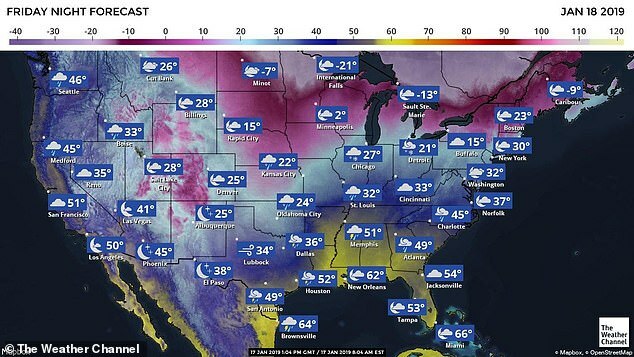 Following the second storm system, a blast of arctic air is expected to plunge south from Canada across the Plains and Midwest on Saturday, hitting the East Coast on Sunday. 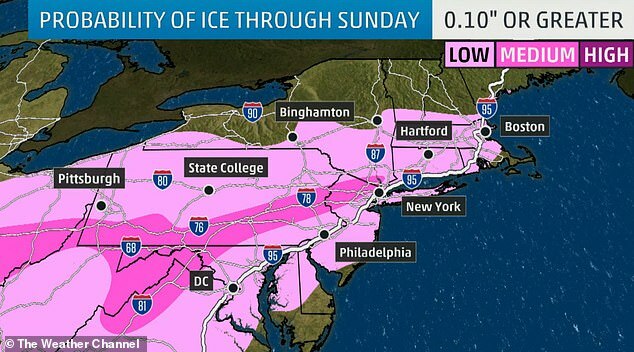 Temperatures could drop some 15 to 25 degrees below normal due to the polar vortex, according to the NWS. 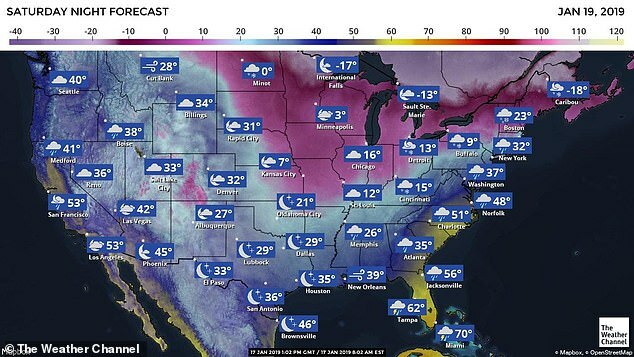 On Sunday, the low temperature is forecast at eight degrees in New York City, with wind chills reaching a bone-chilling minus-20. 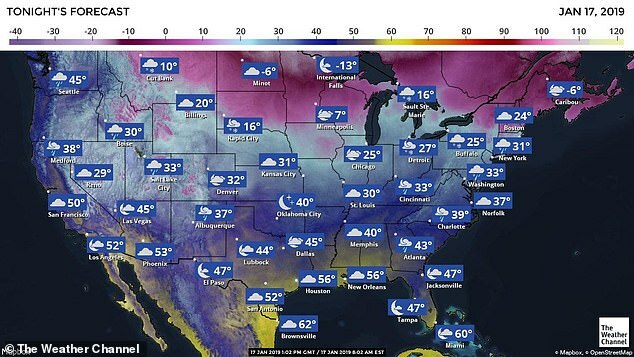 Sunday’s lows are forecast at 9 degrees in Chicago, minus-3 in Cincinnati, 7 in Boston, 10 in Washington DC and 20 in Charlotte, North Carolina. 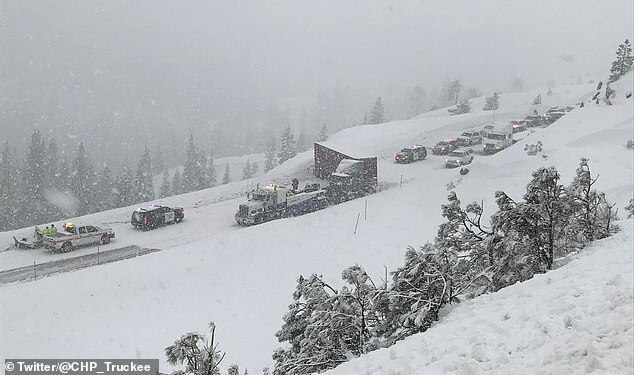 On Thursday morning, California was receiving the brunt of a severe winter storm, and very heavy snow is expected to continue for the Sierra Nevada and also the mountains of northern California. Blizzard warnings were in effect through Thursday morning for the highest elevations, with snowfall amounts in excess of three feet expected. In addition to the heavy snow, heavy rain will also fall across the lower elevations, with most of it happening through Thursday evening. 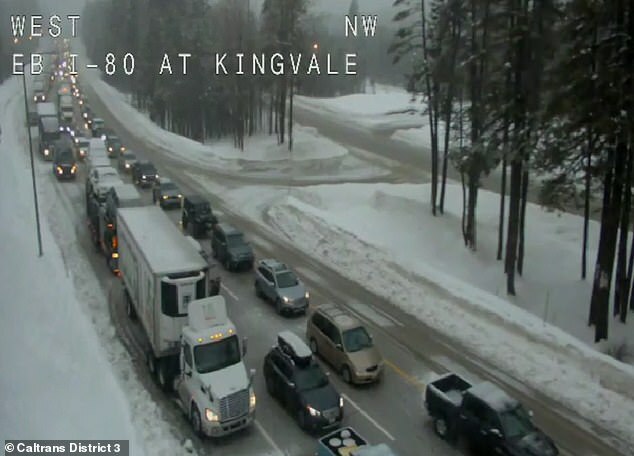 Caltrans reported a storm total of 37 inches of snow in Kingvale since Tuesday. 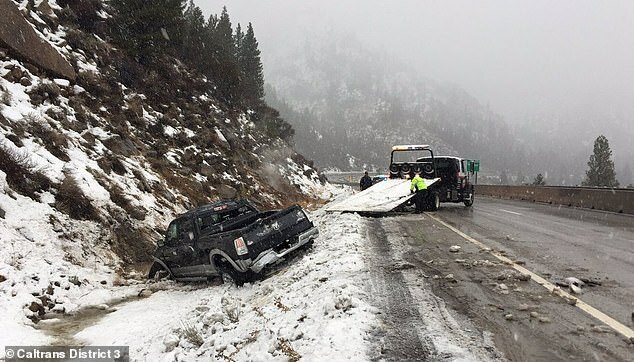 The storm halted traffic on Interstate 80 through the Sierra Nevada overnight on Wednesday, with 44 inches of snow forecast on Donner Summit. Heavy snow from the storm also caused an empty private jet to pop a wheelie. 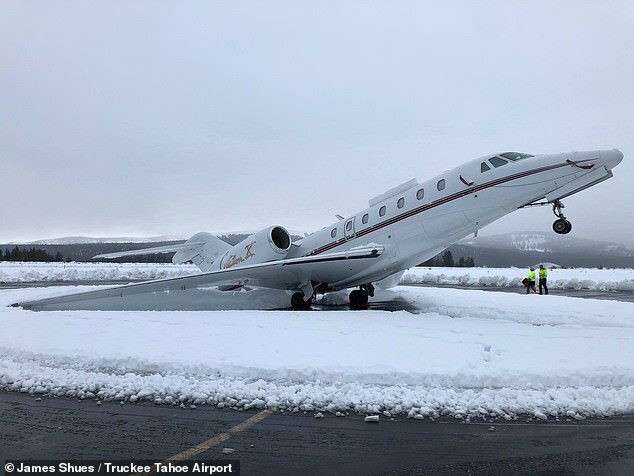 Employees of Truckee Tahoe Airport returned to work on Wednesday to find the Citation X jet had performed the impressive stunt overnight after a foot-and-a-half of snow blanketed the region. Photos showed the snow – dubbed ‘Sierra cement’ for its thick and heavy texture – weighing down the jet’s tail and rear engines, causing its nose to lift off the ground into a stationary wheelie. ‘Morning after 16’+ of heavy #SierraCement at elevation 5,901′ in Truckee Tahoe. A Citation X tail-dragging,’ the Truckee Tahoe Airport said in a Facebook post. 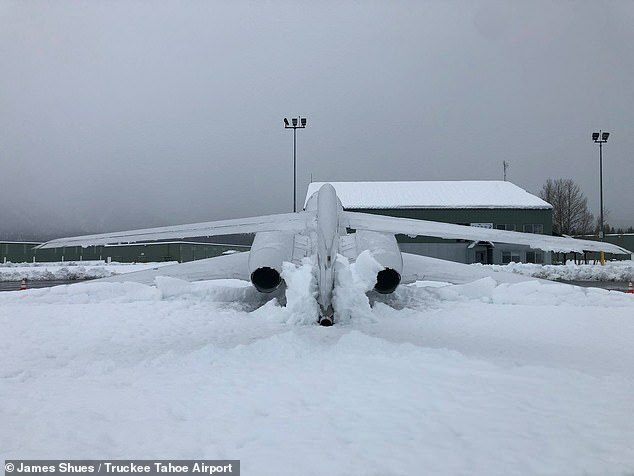 Mark Lamb, the aviation and community services manager at the airport, told Reno Gazette Journal that the aircraft’s massive engines in the rear ‘tend to be a little tail heavy anyway’ and made it easier for the snow to weigh it down. A moderate risk of rainfall has been issued for a small area in southern California, particularly where the burn scars exist in the Los Angeles region. Precipitation will begin to wind down by Thursday night and into Friday morning as the frontal system progresses farther inland across the Intermountain West.